MOSCOW, March 19. /TASS/. Russian President Vladimir Putin said on Sunday government reshuffles will follow the inauguration. "As a matter of fact, all government reshuffles are carried out by the president after taking office. So, I will think what is to be done and how it is to be done," he said answering a TASS question. "All reshuffles will take place after the inauguration," which is scheduled for May 7. "As for the prime minister and the government in general, naturally, I am thinking about that. I am beginning to focus on that from today, since we have to wait the election results. But all reshuffles will be announced after the inauguration," he said. 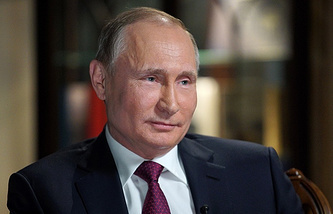 Putin is winning Sunday’s presidential polls in Russia, with 75.5% of the vote, the Central Election Commission said after counting 58% of ballots.